I’ve never made it a secret that I’m one of the few Streetsblog editors that owns a car. But in the new Los Angeles, the one that prioritizes transit projects over highway expansion, that my family of four only has one car that we barely use is becoming the new normal. Yesterday, Streetsblog.net reported on a review of census data by Bike Portland which showed that most of the residential growth in Portland is by households that are either car-free or car-lite. Later in the day, USC graduate student Shane Philips did the same review for Los Angeles at his website, Better Institutions. Philips: *This is a conservative estimate. The numbers exclude households with adults who aren't working and don't own cars (presumably including the elderly and retired), as well as households with one working adult and one car, even though many of these households are likely to be couples with one working parent and one stay-at-home parent. Unfortunately, the survey data didn't differentiate between these households and those with only one adult. Because of this, the actual share of growth attributable to low-car households is almost certainly greater than 90%. Wow! According to census data, L.A.’s growth is far outstripping its fabled car-dependency. Because the data is using census information that ends in 2011, before the city striped over one hundred miles of bike lanes, completed construction of the Expo Line, opened the Orange Line Extension, turned CicLAvia from a curiosity to a must-do event on the calendar, and painted bus-only lanes on Wilshire Boulevard. In short, the growth trend from 2005-2011 most likely isn’t an outlier, but the beginning of a generational change in how people make their transportation choices. And while L.A.’s largest transportation project currently under construction is the laughably over-budget and behind-schedule 405 Sepulveda Pass Widening Project, it might be the last large freeway expansion project inside the city. The other major projects on the book, including the 710 Big Dig, the Long Beach 710 expansion project, the O.C.’s 405 widening project, and the High Desert Corridor are ones that will be built outside of city limits. Update: As pointed out in the comments section, a portion of the southern end of the 710 Big Dig would be within city borders. In fact, none of the Measure R highway projects take place inside of Los Angeles’ borders, a fact regularly trumped by former Los Angeles Mayor Antonio Villaraigosa whenever other Metro Board Members complained about a lack of transit projects in other areas. But, as Philips points out, the city can reap even more benefits from car-lite and car-free households by mounting a campaign against the Holy Grail of car culture a parking policy that forces car-free and car-lite households to subsidize the car dependent. With the right policies in place, we can reap even greater benefits. Right now much of the city still requires tons of parking for new apartments, often far more than developers think is necessary. And you can see why—when nearly half of the city’s new residents don’t even own cars, building a bunch of super-expensive parking for them doesn’t make a lot of sense. Relaxing parking mandates would be nice for apartment-builders, but it’d really be nice for the people who live in them: as Michael Manville of UCLA found a while back, when you relax parking requirements you get more housing, and at lower prices. It’s also good for business, as Santa Monica found recently. Unfortunately, car-culture isn’t just folding its tent and going away as exemplified by the media’s glorifying a law change allowing people to park at expired parking meters. A few of them mentioned that there were no tickets given under the old law in 2013. That’s right, the media was throwing a party over the perception that it would be easier to park a car. Even while the city grows in a more and more car-free and car-lite direction, its record on policy is still a mixed bag. But for today, the news is good. The L.A. of Steve Martin movies is changing, but the city needs to continue to evolve to meet the new generation of working households. This makes sense, and I’ve seen it in the Census data around rail stations. LA’s competitive advantage is that it’s easier to live many parts of the city without a car. Suburbs that grew post 1945 don’t have urban design supportive of driving less. And people are still arguing that new apartment buildings need 2 parking spaces per apartment? Los Angeles needs to allow new buildings with NO car parking, especially in all areas with frequent transit service. Portland has allowed this, and dozens of buildings are under construction or planned with minimal car parking, because developers know the facts above: almost all the growth is in low-car households. The 710 Big Dig southern section will be within LA city limits. Fair enough. That’s why Huizar was always a reliable vote against the project. I will make a note above. Thank you. I’m so sorry for your neighborhood. Perhaps we have reason to be hopeful (I hope to be hopeful) but this article and its source fail to mention that these numbers could just as well reflect the tremendously bad economic downturn we are still mired in. Particularly for lower-income people for whom owning a car was previously just barely affordable, these numbers probably reflect real hardship rather than noble environmentalism or urbanism or whatever we (from our lofty and often a bit out-of-touch Streetsbloggian perspective) hope it to be. Sure, I know people who gave up cars in LA recently. But I bet it’s not even half the story. I’d like to be wrong. But I think this issue needs further study to parse who exactly the new car-lite and car-free people are. And even so, it is still quite astonishing to think that LA is moving in the direction of being more car-lite and car-free- whatever the source of this shift. That has to be significant in and of itself- and it’s fantastic that Better Institutions was able to make this discovery. Yes, I agree as well. The original Bike Portland post did a good job of explaining that the new low-car households are not necessarily new to the city, but that’s been lost in the commentary on LA. 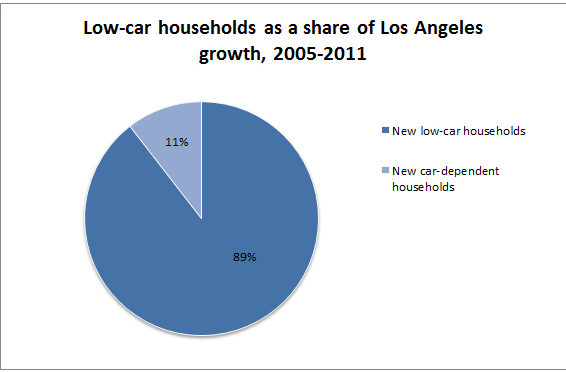 The 20,000 new households in LA and a growth of 18,000 low-car households are separate data points in the American Community Survey, and any connection between them is open to interpretation. While I’m optimistic about the direction of transportation in LA, I think the state of the economy 2005-2011 tells most of this story, as many families made do with less. Makes sense, because as you indicate, people who can afford to move to LA can also afford to have a car. Similar to how high-end transit-oriented development has paradoxically been seen to increase the percentage of the station-area population that owns cars. I’ve heard this point made too, Emily, that high-end TOD housing ends up serving those who commute to work but still keep a car for the weekends. But then below Juan Matute seems to be saying that the Census Data around rail stations confirms the trend to car-lite and car-free. I wonder if it matters which rail stations we are talking about. This era may have seen more cars added at TOD along the gold line, but fewer cars along the blue line, which has little to no high-end TOD. Which rail station it is does matter. If you’re interested in reading more there’s a good report from last year on the phenomenon in LA, which you can find by Googling “is just growth smarter growth” – the first hit at the Labor Community Strategy Center has a download link. It shows that stations gentrified different amounts, but still, overall, station areas lost transit riders and gained drivers much more quickly than the rest of the region. I don’t recall if it talks much about car ownership (or how many cars per household, to get back to this article) but it does address transit ridership and solo driving. @mjs56:disqus, I’m sure that accounts for some of the drop, but this does fit with the narrative of the decline of driving over time, and that decline began well before the recession (roughly 2005 as I recall). I didn’t include all the data I looked at or go into great depth explaining things because I didn’t want the post to get bogged down in details, but I think there’s some data that point in the opposite direction. One thing in particular that I looked at was the share (and absolute number) of households at various low income levels. What I found was that the share of households earning $35k or less dropped from 42.3% to 39.7% between 2005 and 2011. Breaking those numbers down a bit, I found that households making <$10k a year declined by nearly 22k, $10-15k households increased by 5k, $15-25k dropped by 4k, and the $25k-35k households decreased by 4k. That's not to say that many people weren't potentially forced out of their cars, but the numbers are mostly encouraging on household income. And as I mentioned to a friend, while some people may face genuine hardship as a result of having to give up their cars for financial reasons, many may also find themselves better off. I had to get rid of my car for financial reasons about 6 years ago, and while it was a struggle at first I've adapted my lifestyle to it and now have no interest in purchasing a car, even though I can afford one. The tricky thing here is, buildings w/ no car parking are still hard to finance with external funding. Banks are risk averse (hence why real estate is generally very risk averse). Here in Santa Monica, we had a case where a developer sought to put in housing in our downtown district with no parking, hewing to the vision and spirit of our land use and circulation element (LUCE), but he was unsuccessful in finding any parties willing to finance his project. Keep that in mind as you encourage this policy shift; it’s imperative to build the case to banks and other financiers that parking-free buildings in LA or in the LA area can be an excellent investment given the demand for housing near high quality transit corridors or bikeways that don’t include hidden subsidies for parking. After growing for a few years, the share of car-free households in America has dropped below 2006 levels. L.A. vs. S.F. : How Does Transportation Really Compare?